There was that feeling of peace charged with anticipation when I walked on to the Games Field at 8.30 that morning – the second Friday in August – the sort of feeling I used to experience when I took my goats (and boys!) to Agricultural Shows, and we camped over night in anticipation of the early “full udder” inspection before milking our animals ready for the show proper. There would be just a few people around, and the feeling of peace was almost tangible. 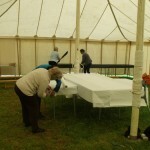 Thus it was when I arrived down at the field ready to do my bit to help in the Craft and Produce tent. Soon after the 8.30 start the competition entries started to arrive – and continued to do so until well after the final closing time of 11.00 am! 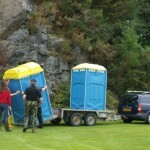 It was, as always, a smooth running team – two people receiving the entries and giving them their numbers and tickets on which the letter indicating the appropriate class was also written. 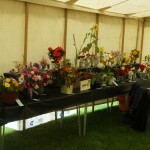 The entries were then passed back to us and we attached the tickets and lovingly placed them on the requisite table. 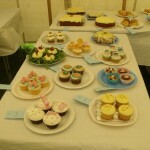 There was a large space reserved in the centre of the tent for the children’s entries, and it seemed at first as though they wouldn’t get filled – but they did! 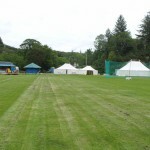 Somewhat belatedly, though, everything was done and the tent looked superb. 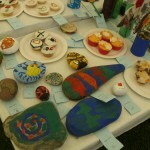 The doors were then shut for the judging to begin – I would have hated to have to choose between so many wonderful entries. 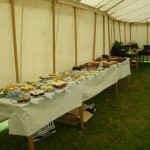 The band of helpers were released to do whatever we wanted until 3.00, when we were asked to be back to help with the auction of those entries – which basically comprised the fruit, veg and baking – which had been donated to sell in aid of the Games. As I was an audience of one (!) 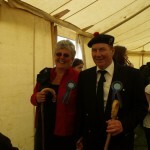 for the pibroch part of the piping competition – most other people being gathered at the other end of the ground listening to the speeches – I was able to beg a much needed chair from Linda Morrison, who was running the competition which took place in a quiet corner of the ground under the shade of a couple of big trees. I took a cup of coffee from my flask, and settled down to listen – trying to take note of the variations, tuarluaths and crunluaths – and just enjoying the music. If it wasn’t for the fact of the children’s rides in full view and the sound of the speeches and what-have-you wafting its way over the Tannoy from the other end of the field, it would have been very romantic, but in spite of these distractions at times I was able to be whisked away in my imagination to ages past and a highland castle, listening to the music of the pipes floating down from the battlements! Well, that is maybe a bit whimsical, but I’m glad to say the Great Music is still around to be enjoyed – albeit mostly played for competition purposes. Personally I just love it, and even Himself enjoys putting on a recording of past masters of the genre. It is the ceòl mòr that I am studying with Sandy, my wonderful piping tutor who is making sure that my old, stiff fingers and brain get round my grace notes in a proper and correct fashion to make me the best piper I can possibly be – which is not saying much, but I enjoy it! There were four pipers taking part in this section of the piping competition this year. The competitors have to submit three pieces and the judge chooses which they should play for him. The days have gone by when it could happen that if the judge chose a piece that the piper didn’t feel was up to scratch, he could salute smartly and say “not today sir” – nowadays the competitors have to be ready to play whichever piece the judge decides he wants to hear. 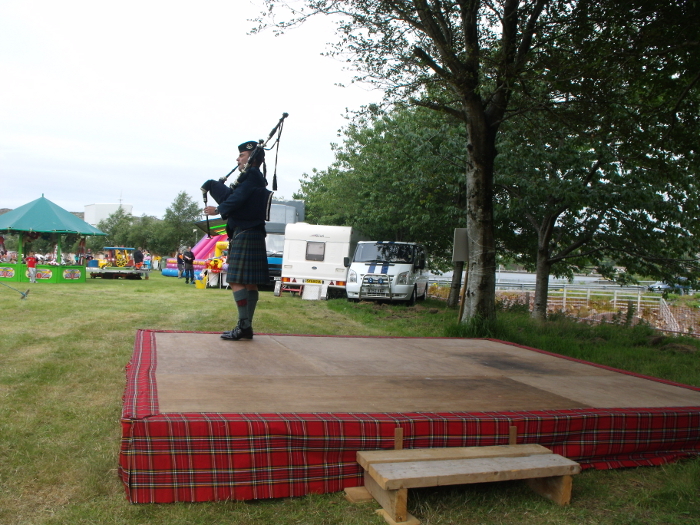 The solo piping was held up for a short while as the Pipe Band marched around the field. 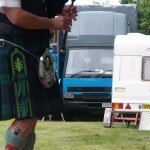 Normally, it is the Ullapool Pipe Band which comes up to grace our Games Day. This is largely made up of children who go to the secondary school there – the Àrd Sgoil – and which of course could include children from Assynt – but this year they had gone off to the World Piping Championships in Glasgow, and a band from the east side had kindly agreed to step in. 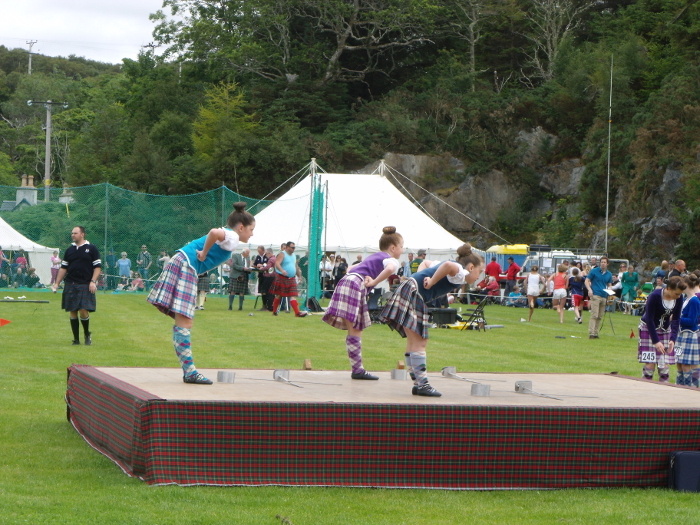 Unfortunately I didn’t manage to find out whence they came – but they appeared to be a mix of adults and children and they looked fine in their traditional Highland rig and played splendidly. 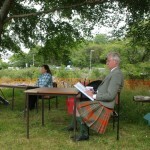 After the band had done their stuff, the pibroch resumed until lunchtime. 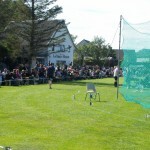 I didn’t stop to watch the light music part of the competition, which included some young pipers in the junior section and which was much better attended, the audience enjoying the music in the warm afternoon sun – but still without any chairs!! 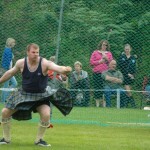 This entry was posted in Local area, Social events and tagged An Gearannan, Highland Games. Bookmark the permalink.